The design and color schemes of the Adidas Solar Glide were lauded by those who have tried it. Many people felt that the size options followed their expectations. The width profiles suitably accommodated consumers who had medium foot-dimensions. The underfoot cushioning was appreciated for being responsive and comfortable. Several runners noted that the lightweight nature of this running shoe ensured a speedy performance. The general quality of the materials was considered to be dependable. A couple of reviewers appreciated the outsole unit’s capacity to hold onto the surfaces. According to a tester, some friction could be felt on the eyelets of the shoe whenever the laces were tightened. A purchaser claimed that it was slightly larger than what he expected. The Adidas Solar Glide was mainly well-received by those who have tested it. People were happy with the aesthetics of this neutral shoe, as well as its lightweight build and quality materials. Contrariwise, there were some minor qualms about material rubbing while a single complaint was directed to the inconsistent sizing. Adidas Solar Glide review: Running shoe or Swiss army knife? At first glance, there seems to be a lot going on with the Adidas Solar Glide, external heel counter, high tag at the back, rails down each side, stripes and various textures on the upper. It’s easy to look at the shoe and think “wow, it looks like someone got carried away with their scrapbooking materials in the design lab”. This leads to the big question, what is it all for? I’m going to break it all down by the components of the shoe and discuss each feature, hopefully by the end it will be clear exactly how incredibly well designed this shoe really is. The upper of this shoe looks busy indeed, stripes across the toe-box, the iconic 3 Adidas stripes emblazoned on each side, beneath the stripes there is a stiffer almost clear midfoot saddle, the classic flexible, plastic heel counter we have seen on many Adidas runners now and a funny little area on the right side of the toe box with yet a different pattern. Each of these features has a purpose. The heel counter which I will delve into later is external primarily I believe because that way it doesn’t rub, and they don’t need to add another layer of material between it and your sock. The clear material forming the midfoot saddle adds more support to that region hugging your foot and adding strength to the upper. The stripes across the toe box are there to add flex where you want and need it to the upper material but to allow stretch for a more generously sized forefoot. The patterned area over the big toe is a tougher area that will help to reduce the chances of a hole being worn in the upper by the big toenail of those who have a tendency lift their big toe when the lift their foot. Having sold shoes for the past 2.5 years, I can tell you this last feature is very clever, one of the most common complaints I hear from runners and walkers alike is that there is a hole about an inch back from the tip of the big toe. Most people fail to realize that it is a biological issue in most cases rather than a manufacturing flaw. Overall, it has enough stretch for those of us who have a slightly wider foot, but it is still just a regular D width so if you need a solid 2E or 4E width it’s probably too narrow for you. Many runners and walkers need to be able to put an orthotic in their shoe, in this case, I would approach with caution and try before you buy because although the upper is generous enough you may run into issues if you have a high instep and a thick orthotic. The midsole of this shoe is remarkable. It is comprised of 85% Ultra boost capsules and 15% EVA in the form of the guide rails situated on both the medial and lateral side. The shoe comes in both a neutral and stability version with a denser area of Ultraboost midsole along the medial longitudinal arch for those who pronate more heavily in the stability version. The guide rails in the neutral version, however, are in my opinion enough stability for a light to moderate pronator. To touch on these rails a little, my view is that they are an evolution of stability technology and I feel they will supersede the more traditional dual-density EVA medial posting system we see in some of your more traditional stability runners. The guide rails tend to help reduce excess movement and provide motion control to either the medial or lateral side which makes the shoe more versatile and able to be used by runners who tend to roll either in or out (pronate or supinate for those of you more down with the lingo). I have noticed however that like all EVA midsoles it is starting to wear and develop creases, though this does not concern me because the real cushioning comes from the other component of the midsole, the Ultraboost component. This is in my view the most responsive midsole material that I have tested. It is beautifully soft but not gluggy, it provides exceptional energy return as well as cushioning. Overall, I find this to be supportive, flexible enough to conform to terrain and exceptionally cushioned. One criticism though is that if you are a toe striker, you may notice the Ultraboost component ends about 2 inches before the EVA rails and you may notice that during your runs. The heel counter is split and flexible, this means that those of you who find that you tear up your inner lining around the heel in shoes with a full wrap around rigid heel counter will likely not experience that in this style of shoe. It is stable enough to give heel control and prevent your rear foot slipping off of the midsole but doesn’t attempt to lock your heel tight and prevent motion. This, in my opinion, is all you need, research has shown that the more rigid hell counters fail to prevent calcaneal eversion anyway. Overall its perfect, there's room for your Achilles tendon to move, not too heavy and gives all the support you will need. The one piece stretched web outsole is going great so far. I have only put about 60km through these, so I can’t say for sure. One thing I can tell you though is that over the 2.5years I have sold shoes I’ve never had one of these outsoles returned due to excessive wear. Adidas uses it prolifically and it seems to work well for my customers. Other styles of the outsole that have multiple small pieces can tend to peel off here and there especially if used on gravel or off-road. I have tested these on grass, gravel, and pavement and they offer great traction on all surfaces and the flared forefoot gives an optimal ground contact for traction and propulsion. Some ladies who like their foot to look narrow complain that it makes their foot look wide however as I explain to them no one else looks down on their foot the way they do and thus no one else will even notice. The inner hugs the foot comfortably but does not have a great deal of plush cushioning. It has, however, what it needs and I never put on these shoes and feel that it is missing anything, also the lack of superfluous padding keeps the weight down. Weighing in at 306g, it's not super heavy compared to some of the other cushioned and stable running shoes, the 10mm drop keeps the pressure off of your Achilles and the size is generous and true in comparison to other brands. From beginning to end of every run, this shoe offers a smooth effortless ride that makes you want to go back for more. Coming in at just under $200AUD, it is batting way out of its league. 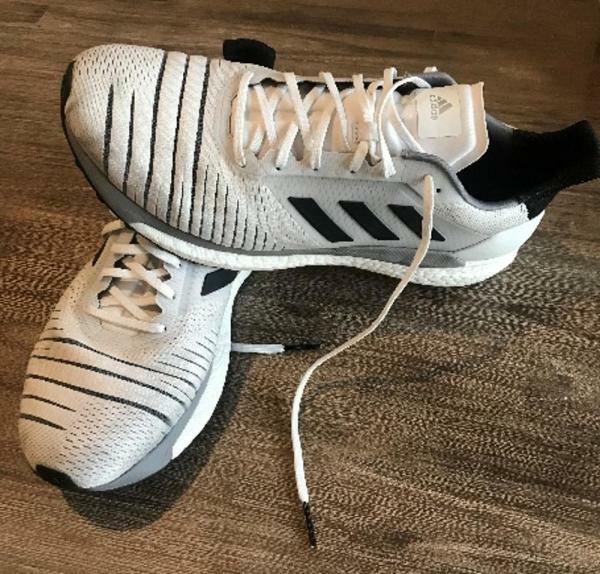 Whether running, walking, functional training or weights training, I’d recommend this shoe for any activity you would expect a running shoe to be appropriate for. At 90kg, I find it easy on my knees and sublime on my feet. I will buy more of these when these ones are done. The Adidas Solar Glide is a running shoe that’s designed for those who have neutral pronation. It makes use of an engineered mesh upper for flexible and breathable support. Printed overlays bolster the façade, ensuring a secure coverage. The well-known boost™ foam serves as the primary cushioning unit of this road footwear. It is responsible for carrying the foot throughout the running session. A supportive sidewall called the Solar Propulsion Rail keeps the foot locked in place. Continental™ rubber is utilized for the outsole unit of the Solar Glide. It is a racing-car grade material that aims to provide protection against wear and tear. The Stretchweb design makes the platform more flexible because of its pods-and-grooves configuration. The Adidas Solar Glide features a sizing scheme that follows the usual choices of runners. When it comes to the width, the standard options are used, specifically B – Medium for women and D – Medium for men. Those who have medium foot-dimensions are the ones who are likely to enjoy the in-shoe experience. The semi-curved structure of the last and form-fitting construction of the upper unit are indicators that this shoe is able to accommodate the natural curve of the human foot. The outsole unit of the Adidas Solar Glide makes use of a Continental™ rubber layer. This material covers the entire length of the platform, shielding it from the abrasive nature of the surfaces. It is also the one that doles out traction. Same as the popular Adidas Ultra Boost 19, the Solar Glide uses the Stretchweb design which involves the level distribution of the rubber compound across the surface of the outsole. Such a configuration forms a grid that has circular traction pods and flex grooves. Boost™ is a cushioning unit that is born out of the amalgamation of thousands of thermoplastic polyurethane pellets. This full-length technology is the one that’s responsible for cushioning each step and keeping the foot comfortable. The Solar Propulsion Rail is a raised sidewall that holds the foot in place. It works in conjunction with the main midsole foam, guiding and supporting the foot as it goes through the gait cycle, potentially smoothening the heel-to-toe transitions in the process. A thermoplastic unit in the midfoot section called the Torsion System bolsters the structure of the midsole. It also supports the underside of the foot, keeping the muscles and tendons engaged and energized throughout the running session. The upper unit of the Adidas Solar Glide is mainly comprised of engineered mesh. It is a stretchy, cloth-like fabric that offers a next-to-skin feel. It has been updated with a Flex Fold structure, which means that it has indented sections in the forefoot for flexibility. Synthetic overlays are printed onto the sides of this running shoe. These seamless add-ons bolster the eyelets of the lacing system while also holding the foot in place. Semi-flat shoelaces help the wearer in maintaining a secure yet customizable fit. The FitCounter is made of an externally placed molded piece that secures and locks the heel in the foot-chamber. Its purpose is to prevent wobbling and accidental shoe removals. The cushioned collar and tongue are components on the upper unit that support the dimensions of the wearer’s foot. These padded sections also ward off in-shoe quavering and irregular movements.